Raymarine Axiom XL MFDs with ClearCruise AR augmented reality. See what lies ahead on water with integrated real-life camera views. Marine electronics manufacturer FLIR Systems has launched a new augmented reality feature that integrates with its Raymarine Axiom multifunction displays (MFD) via a high-definition marine camera. Called ClearCruise AR (Augmented Reality), the technology is designed to increase the navigational awareness of boaters by displaying real-time images of on-water objects in combination with navigational information on the Axiom displays. The system displays nearby navigation markers, automatic identification system (AIS) traffic, objects, and waypoints in sync with real-world imagery for instant recognition, making complex navigation and high traffic situations simpler to understand. 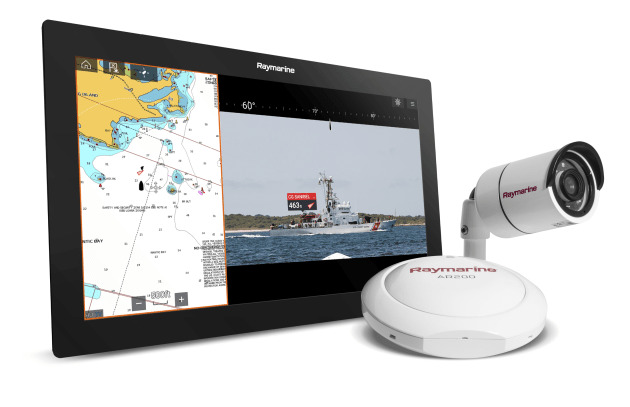 Raymarine has previously used augmented reality imaging with some of its smaller fishfinders but that technology relied on a using a smartphone and app to display the navigational objects. 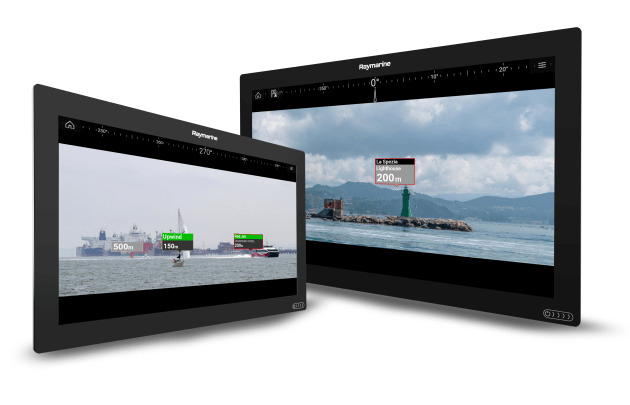 In contrast, ClearCruise AR video imagery is supported by Raymarine CAM210 HD marine cameras to provide the augmented reality view from any camera position on the vessel. It also integrates with a new video stabilisation module, the Raymarine AR200, which includes a precision GPS/GNSS sensor and the same attitude heading reference sensor (AHRS) technology used in Raymarine’s Evolution autopilots. ClearCruise AR video imagery is supported by Raymarine CAM210 HD marine cameras. ClearCruise AR recently received the Innovation Award in the OEM electronics category at the IBEX marine industry event in Tampa, Florida. ClearCruise AR for Raymarine Axiom, Axiom Pro, and Axiom XL MFDs is compatible with the forthcoming LightHouse 3.7 OS update. The CAM210 HD marine video camera (RRP $999 inc GST) is currently available through FLIR’s network of Raymarine dealers and resellers. The AR200 video stabilisation module (RRP $899 inc GST) and LightHouse 3.7 will be available to download this month. To find out more about ClearCruise AR, visit the website. Marine Business is Australia’s only recreational boating business magazine and online media brand. Australian Sailing + Yachting magazine covers the whole spectrum of sailing from dinghies to maxi yachts, for competitive racing or pleasure, with coverage of every major Australian yachting event plus overseas races. Cruising Helmsman concentrates on providing information on cruising destinations plus advice on practical boat owning, mono or multihull. Fishing World is Australia’s longest established fishing magazine and has been serving the needs of anglers for more than 46 years.